When I look at my daughter my heart swells. I think about how I can’t wait to see her grow up, watch who she becomes and see her own little family happen. This thought is always matched by the fact that in order to do so, I must take good care of myself! Because of this, I have been on a bit of a healthy lifestyle change kick. NOT a diet. I don’t believe in those. I am just focusing on eating foods that fuel my body, going more natural, portion controlling and just being aware of what I am putting in my body. is my evil sweet tooth! Low and behold, late at night my body starts to crave those sweets. When you want chocolate there just isn’t really any good replacement that will do. This is exactly the scenario that played out last night. Dinner had been eaten, chores had been done. I was sitting down relaxing when a massive chocolate craving hit me out of the blue! I NEEDED something chocloately, but I didn’t want to put a damper on all the effort I had been making towards my health. Cory recently purchased some great cookbooks for me, one of which is called “Comfort Food Lite”. It is amazing and chock full of delicious low fat/low cal dinner and dessert ideas. I quickly flipped through ravenously searching for a healthy chocolate treat. Low and behold….I found one! It was very quick to mix up and only needed 25 minutes of baking time. When it was done, Cory and I both dug in and…YUMMMMMM! Rich, gooey, amazingly chocolately goodness! The recipe actually makes 10 servings so we have plenty in the fridge for any other chocolate cravings that may sneak up on me this week. This would also be a lovely treat for a holiday or dinner party! After enjoying it so much I feel like I just HAVE to share this amazing recipe. in a small saucepan, combine 3/4 cup sugar, cocoa, flour and salt. gradually stir in water. Bring to a boil; cook and stir for 2 minutes or until thickened. Remove from the heat; stir in chocolate chips, coffee and vanilla until smooth. transfer to a large bowl. In another bowl, beat eggs and egg white until slightly thickened. Gradually add the remaining 1/2 cup of sugar, beating until thick and lemon-colored. Vfold into chocolate mixture. 1 serving= 131 calories, 1 gram of fat, only a trace of saturated fat, 42 mg cholesterol, 49 mg sodium, 29g carbs, 1 g fiber, 3 g protein. Diabetic exchange: 2 starch. seriously! try it and let me know what you think! This entry was posted in Cooking, Desserts. ← Valentines Day….the baby way! 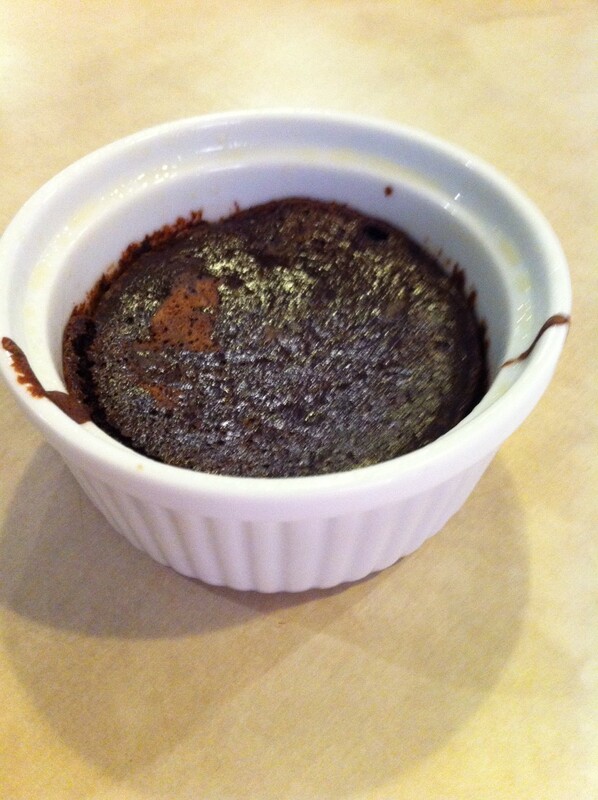 This looks SERIOUSLY yummy..now if only i had ramekins, darn it!